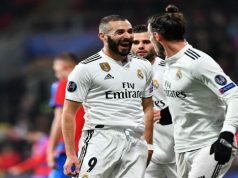 Real Madrid claimed a record 16th consecutive victory in all competitions as they beat Malaga 2-1 thanks to Karim Benzema and Gareth Bale goals. 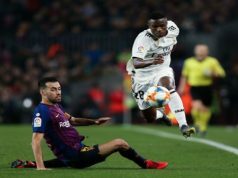 Los Blancos seemed very comfortable from the start and Gareth Bale was first to threaten with a powerful shot from long range that was denied by Carlos Kameni. The veteran goalkeeper was superb to deny Cristiano Ronaldo a couple of minutes later. The keeper’s performance gave Malaga confidence and the hosts started dominating possession. Yet, Los Blancos midfielders were superb defensively and launched counter-attacks constantly. In one of them, Ronaldo dribbled past two defenders and assisted Karim Benzema to make it 0-1. The Frenchman got his 13th goal of the season in a controversial play, since he seemed to have fouled Weligton before meeting Ronaldo’s cross. Iker Casillas had a couple of lucky escape during the first half. First, he saw Sergi Darder’s volley slip between his legs and hit the post. Minutes later, Duda sent a brilliant effort from 30 metres to the crossbar. Los Merengues had the best chances after the break. However, Kameni was a nightmare for Real strikers. The Cameroon international denied Bale and Isco when they were about to score. 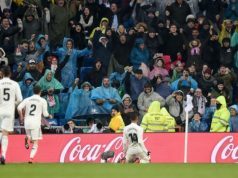 Ronaldo also had a golden opportunity to score when presented with the ball inside the area, but even he couldn’t beat Kameni as the keeper dived to his right to turn the ball to safety. Carlo Ancelotti men finally doubled their lead when Bale finished a counter-attack with a precise right-foot shoot. Roque Santa Cruz scored for Malaga in stoppage time with a perfect header, but there was no time to even try to equalise.